Amelia McPhail was born on October 17, 2018 at Forth Valley Royal Hospital, weighing 7lbs 9oz. THE PARENTS: Mum Taz Razaq (41) and dad Paul McPhail (39) both work for the Department of Work and Pensions. The family live in Tamfourhill. THE PREGNANCY: With a difficult pregnancy, Taz felt that although she had a number of problems it was all worth it in the end. THE BIRTH: Taz’s birth with Amelia was not as bad as she had expected it to be. Amelia was born at 2.21pm with little problems. THE BABY: Amelia is a great baby who had a few complications at the beginning but is now shining through. She is a great sleeper who often gets six hours a night. THE NAME: Taz and Paul chose Amelia as her name as it was something they both loved. Taz had liked Emilie but wanted something a little more unusual. They had also liked Harper but when she was born they knew that Amelia was a perfect name. 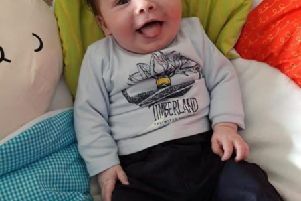 THANKS: Taz and Paul would like to give thanks to all of the staff at the sub fertility treatment ward and all of the midwives that helped Taz with the birth so it went as smoothly as possible.